Beautifully engraved Certificate from the Kidder, Peabody, & Co Transfer Agents for Philadelphia, Wilmington, and Baltimore Railroad Company issued in 1870. This historic document was printed by Rand, Avery and Frye in Boston, Mass. and has a block border. This item is hand signed and is over 147 years old. Punched cancelled. There is also a Civil War Era Tax Stamp of George Washington affixed to the certificate. 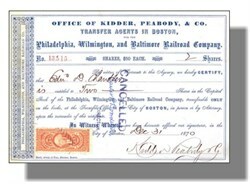 Kidder, Peabody & Co. was established in April 1865, conducting business in banking, brokerage, and exchange. The Company was a reorganization of its founding company, J.E. Thayer & Brother. Henry P. Kidder, Francis H. Peabody, and Oliver W. Peabody had served for many years as clerks in Thayer & Brother. At the time of Nathaniel Thayer's retirement the firm's banking experience and business practices, as well as many of its clients, passed to Kidder, Peabody & Co.
John Eliot Thayer, son of a Unitarian minister, began his own private banking and brokerage house in Boston in 1824. In 1826, he moved his office to 47 State Street, the center of Boston's financial district, where he continued in business until his death in 1857. He was married to Anna Francis, the daughter of Ebenezar Francis, a wealthy shipowner, merchant, and financier. J. E. Thayer was regarded as a leading figure in the Boston financial district. He helped to establish the Boston Stock Exchange in 1834 and was active in organizing the Boston Board of Trade. Some of the services provided by his brokerage firm included raising new capital for business and government, buying and selling securities for clients, and providing financial advice to corporations. He also advised wealthy individuals on their investments. Thayer dealt in foreign exchange, but did not participate in foreign trade. Thayer continued in business for himself until 1839 at which time he admitted his younger bother, Nathaniel Thayer, into the firm. J.E. Thayer & Brother was organized in June 1839. The business never had more than two partners, and Nathaniel Thayer became head of the firm upon John's death on September 29, 1857. There were no significant changes made to the firm or its functions. It continued to engage in a wide variety of banking and brokerage activities. At the time of its reorganization in 1865 J.E. Thayer & Brother was one of Boston's leading private banking and brokerage houses. Henry P. Kidder and the brothers, Francis H and Oliver W. Peabody were all natives of Massachusetts, well-known among the state's business and financial leaders through their long association with Thayer & Brother. Henry Kidder, born in 1822, was the son of a Boston fish and meat inspector. He attended the Roxbury Latin School. In 1845, at the age of 23, he became the confidential clerk of Nathaniel Thayer and made partner upon the senior Thayer's death. Francis and Oliver Peabody were the sons of a Unitarian minister. Francis went to a public school and worked in the Chicopee Bank in which the Thayers had an interest. In 1847, at the age of 16, he become a clerk in the Thayer firm. Three years younger than his brother, Oliver Peabody joined the firm upon his graduation from Phillips Exeter Academy at the age of 15. He left in 1862 to serve in the war and returned to join his brother and Kidder in the newly organized firm. Kidder, Peabody was a diversified banking house, as was the tradition established by Thayer & Brother. It offered a wide variety of financial services and like many private banking houses in Boston and New York fell into two broadly defined categories: banking and investments. As a bank, Kidder, Peabody accepted deposits, dealt in gold and specie, made secured call and time loans, bought and sold foreign exchange on a commission basis, and issued commercial and travelers' letters of credit. The firm also expanded its investment operations: dealing in federal, state, and municipal securities; buying and selling corporate bonds and stocks on commission in Boston and other markets; trading and investing in securities on its own account; originating and distributing new issues; acting as fiscal agents for the companies the firm had helped finance; and participating in the management of corporations. Kidder, Peabody increased the activities and volume of its business and modified them to meet the changing needs of its clients. It had a partner on the Boston Stock Exchange Board and a representative on the New York Stock Exchange. The unfortunate part of 1994 was that the many achievements and terrific performance of GE people were often overshadowed by the well-chronicled problems with Kidder, Peabody. Whether or not it was a good idea to buy Kidder in 1986 is academic -- in the end, it simply didn't work out. In 1994, weak trading markets lowered Wall Street earnings by billions of dollars from the levels of 1993, and Kidder was not immune to the weaknesses in these markets. But Kidder had another problem: a phantom trading scheme by a single employee, directed not against customers but against the firm itself, which cost it $210 million in net income. The combination of the two circumstances -- a downturn in earnings, and an employee's wrongdoing -- made it clear to us that it was time to get out; thus the sale of the brokerage assets of Kidder to PaineWebber, in return for 25% equity in that firm, and the liquidation of the trading operation. Tucked in the shadows of the buyout of PaineWebber by the Swiss investment bank UBS is both the tangled wreckage of Kidder, Peabody -- the once-esteemed Wall Street brokerage firm that collapsed in 1994 under the weight of a bond trading scandal -- and the ambitions of General Electric to become a Wall Street powerhouse.